HandBrake is a dedicated software to convert videos from one format to another. As input sources, supports a large number of formats, but as output you can create only MP4 and MKV. The big advantage of using this program is that will allow you to customize and change the settings of the new video file. You can change the width, add filters, change video codec and FPS (frames per second), change the quality, change the audio codec and bitrate, add subtitles and chapters. The program is easy to use and after you select the source file(s), you can set different options or jump directly to conversion as MP4 or MKV. It includes different presets corresponding to different devices such as iPhone, iPad, Android, Windows Phone etc. Furthermore, HandBrake can process DVD and Blu-ray files. Cons: As output, supports only MP4 and MKV, but these are 2 very popular formats that will work on all devices. 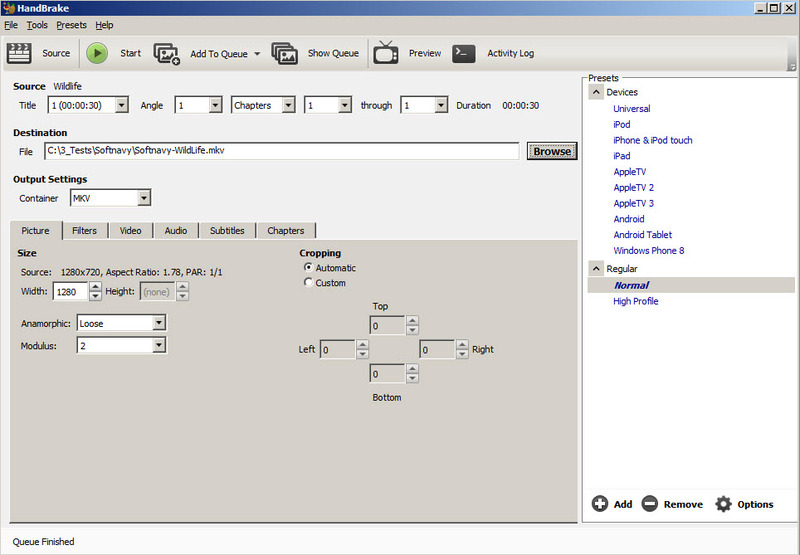 HandBrake is available as free download for Windows 32-bit and 64-bit. HandBrake is 100% clean and safe to install. You can see the test results here.